NEW equipment, NEW services, NEW commitment to excellence! 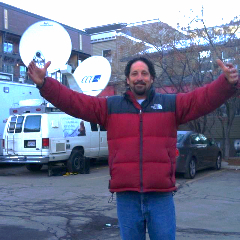 For the 6th year in a row our truck will be parked atop Main Street in in Park City Utah offering a great live shot location, play outs and EFP services at a moments notice to ALL. At the very least stop on by and say hello! Jan 28th- Feb 08: SUPER BOWL 50 ! Santa Clara, Ca. CCU is credentialed and standing by ALL over the bay area to cover the biggest local event in Sports History. Offering affordable KU HD LIVE SHOTS for anywhere, Play outs and EFP services. BOOK NOW. and we would like to THANK YOU for your continued opportunities, suggestions, loyalty and inspiration.Whether you are a returning client, or new to our reliable services. * Mobile Production Services from 1 cam to 8! Your EFP and Mobile Production choice.